Favored by the mighty and the meek the wizarding world over, Ogden's Old Firewhiskey will put hairs on your chest or at least a smoldering sensation in your belly. 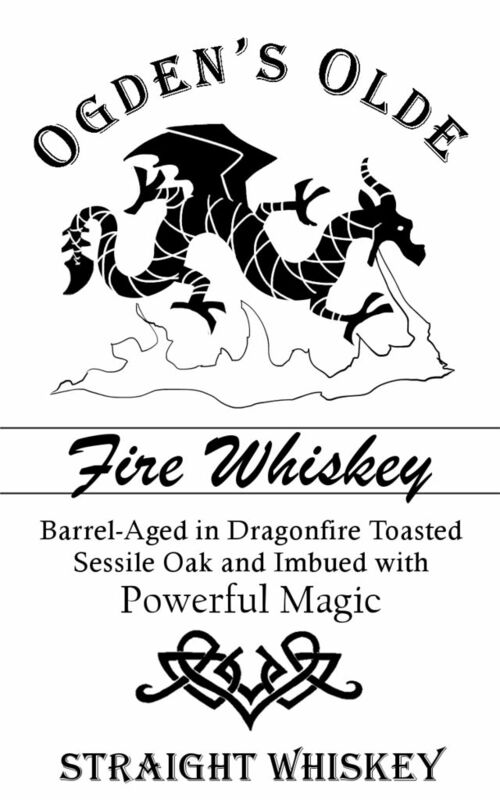 This whiskey is aged in barrels that have been toasted by dragonfire which imbues the barrel wood with deep magic, granting the drinker bravery in the face of metaphorical fire. I was inspired to create this libation after reading about it in Harry Potter. I remember dissolving red hots in vodka and apple cider in my college days. So I pulled out the red hots, dusted them off (ok, I bought fresh at Wal-Mart), and tossed them into some whiskey. Then I added cinnamon sticks to create the whole cinnamon round-up of flavor. It's spicy and warm--perfect for cool Autumn nights and Halloween in particular. *You can use Scotch, Irish Whiskey, Bourbon, Canadian Whiskey; blended or straight--It's entirely up to you. I used the cheapest bourbon I will drink straight-up but you can go wherever you'd like on the quality/price spectrum. Follow the rule of thumb with liqueurs and infusions: don't use it if you wouldn't drink it straight-up. Find a clean glass container with a lid such as a bottle or mason jar. You can also use the bottle your spirits originally came in--you just have to take a few swigs to make room for the candy. Measure how much you are adding and be sure to leave at least 1/10th of the container empty. For every ounce of whiskey, add 6-7 red hot candies to your container. I used a 750 ml (about 25oz when full) bottle of bourbon, poured out about 1/2 cup, and added 135 red hot candies. Shake your container occasionally. It only takes a few hours for the candy to dissolve. The candies are coated with carnuba wax so, once the candy is dissolved, you'll want to filter it through a coffee filter to keep the whiskey smooth. Bottle the filtered whiskey and drop the cinnamon sticks in the bottle. Leave them in there one week or more. You can also keep them in the bottle indefinitely. I have had some interest in the label on the bottle. My daughter designed dragon on the label. She is a kid but a very good graphic and comic artist. Either print this label onto paper with a parchment design or age it yourself using the instructions I've posted here: Aged Paper Labels. Seal the front using acrylic sealer, Modge Podge (if you are using that to adhere it to the bottle), or simply rub with candle wax. The label can be added to a bottle using craft glue, Modge Podge, or spray adhesive. Sounds great! Gotta try it. I was in Anchorage, Alaska and went in to a bar where their signature drink was Cinnamon Schnaps with Tabasco - they started you with a couple drops then added more if you were so inclined. Sure kept the cold out! Went home and bought a dozen shot glasses so I could share it with all my friends. That sounds really good! I'm going to have to try Tabasco with it. Did they have a name for the drink? When I was stationed in Fairbanks (late 80s, early 90s) there was a bar that sold them under the imaginative title of "Red Hots." YES. I made this and shared about a shot each with my suitemates; they got annoyed when I stopped sharing after that! Definitely making it again, and definitely not getting over-eager next time and drinking it before the cinnamon's had a week to stew in there. Couldn't you just use some Cinnamon Oil from a cooking shop or health food store? I've made "Red Hots Vodka" a couple of times (I'm determined to make flavored vodka with ALL of the hard candies in vodka eventually) and the remnants of non-dissolvable solids that wind up in the bottom of the bottle are barely noticeable the next day (although you could certainly pour through a coffee filter if you have the desire). I use a 6 oz. package of Red Hots to a 1.75 liter of vodka and still have a couple of packages at hand for doing this - all of my housemates are big fans of Harry Potter so Ogden's Olde Firewhiskey will be quite popular as Christmas gifts! This looks great! I can hardly wait to try making some! Hey can you provide a PDF of the label? Yes, as soon as I find the file. It seems to have disappeared on me. I forgot that magic and technology don't like to mix. OMG I need that label you created! please please please tell me you still have it?! If Not I will commission it from you! I want to make this recipe for my friend's birthday and that label would be the icing on the cake. I can't find any label that even compares to it! I found the label and added a step including the graphic. It's a PNG file. I hope that works for people. If not, let me know and I'll add it in another format. It tastes similar to Fireball Cinnamon Whiskey. You might consider getting one of the little 50ml bottles of it if you're unsure or curious. I considered simply relabeling a bottle of Fireball for our Halloween party but it sounded fun to experiment and try to create my own version of this drink found in the Harry Potter books. I'm a big fan of the series and am aware of this. In the tradition of strange (including medical) cocktail names, I was inspired to name the drink after the fictional malady. can you use like....one or two crushed up cinnamon jolly ranchers/oz? Yes. I'm not sure how many it will take but you can certainly try to use them, taste the results, and add more as needed. ok brill. i thought it might make things easier since they have no waxy coating on them.